Place : SHENYANG ,Liaoning ,China. The working period of ordinary workpiece is less than 2 minutes after it enters the main machine, which is 2-4 times of the efficiency of common positive and negative pressure membrane pressure equipment. The product processed by common film has clear groove, no open side, bubbling, no color difference, and high light working surface has strong adhesion, and the effect reaches the international leading level. The total power of the machine is 43KW, which is one half of that of the peer equipment;The main heating starting power is 18KW, and the average power consumption is 13KW/h. The key part of the machine adopts original parts from Germany, Japan and Taiwan, which is high configuration and stable performance. The whole machine adopts automatic top block. Compared with other domestic manufacturers, it saves the technological process of making the pad, saves the cost of process raw materials, saves the scanning sequence of the pad of the equipment, saves the time of laminating process, greatly improves the working efficiency and reduces the labor cost. 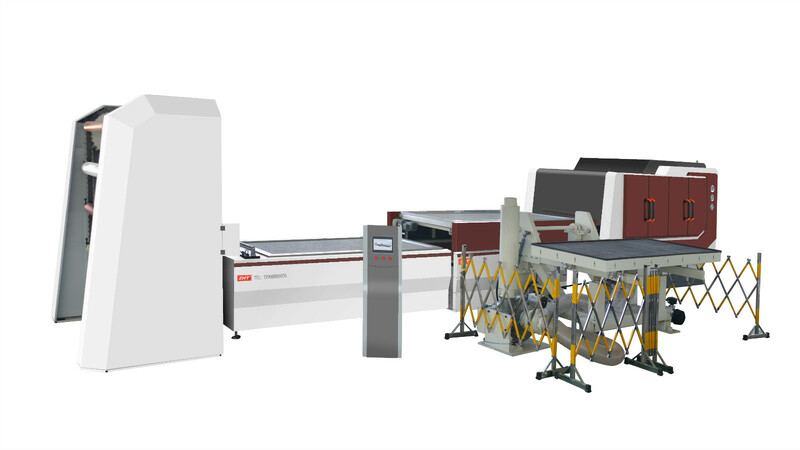 The machine is equipped with automatic fabric selection tilting rack, automatic film cutting device, automatic gasket device, laminating device of pressing machine, pallet lifting device and finished product rollover collection device, etc., with high degree of automation, smooth and close process and one-stop film-covering process production.The height of the top block can be selected 12, 15 and 18 mm, solving the phenomenon that the high-light sample block is not in place. we established a strong r&d team, it reached world leading level in the research coated effect, energy loss and performance configuration, it launched a series of high-end performance laminating machine, Up to thirty varieties, widely used in all kinds of cabinets blister (membrane pressure cabinet), solid wood veneer cabinet, solid wood composite door, no paint door, board type furniture, profile coated, etc. The products have passed the European Union CE certification, and the equipment is exported to Europe, America, southeast Asia, Africa and more countries and regions. The high-gloss PVC series press developed by shenyang zhanhongtu, and the positive and negative pressure series press machine belong to the top quality of the industry, which brings the unexpected processing effect to the customer group and better meets the customer demand.